Deep, moisture-retentive but well-drained, slightly alkaline soil. Best grown against a sheltered south-facing wall in cool climates. Elsewhere apricots need full sun to limit disease and produce high quality fruit. Yes, but it is important to choose varieties known to grow well in your area to reduce risk of losing blooms to spring freezes. Cold damage to apricot blossoms is a major limiting factor in where they can be successfully grown. Feed with balanced organic fertilizer in early spring. Keep the area beneath apricots mulched with wood chips, straw, or another mulch that helps maintain soil moisture. Basil, Tansy and Garlic. Corridors within the orchard that are planted with clovers and other legumes contribute to soil fertility and attract pollinators. Prepare a large hole by breaking up the soil and adding plenty of well-rotted organic matter. A wide hole is better than a very deep one. Mulch after planting, and encircle the trunk with a wire cage or protective pipe to protect the young tree from animal and insect pests. Young apricot trees are at high risk for damage from insects that bore into the main trunk. Prune in spring or mid to late summer in the cool climates. Elsewhere prune apricots in late winter. Healthy apricot trees will bear for ten to fifteen years or more. Harvest when the fruit is soft and can be pulled easily from the tree. Ripe apricots fall to the ground. Dieback and oozing resin can often be remedied by improving growing conditions. Mulching, watering, feeding, weeding and hard pruning can all help. In humid climates, apricots often develop problems with fungal diseases such as brown rot. 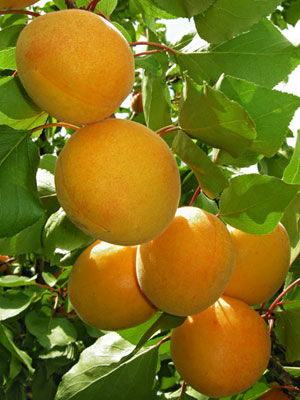 Preventive sprays with organic fungicides are often needed to grow good quality apricots. Plum curculios feed on buds, flowers and unripe fruits. Control by allowing hens to feed around trees, or shake branches to dislodge the insects onto a sheet then plunge into very hot water. Remove any fallen fruits as soon as possible.